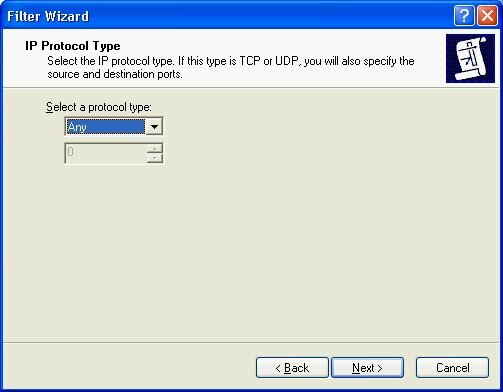 IPsec is a tool you can use to secure your network communications. I use IPsec to ensure my wireless connections are secured. 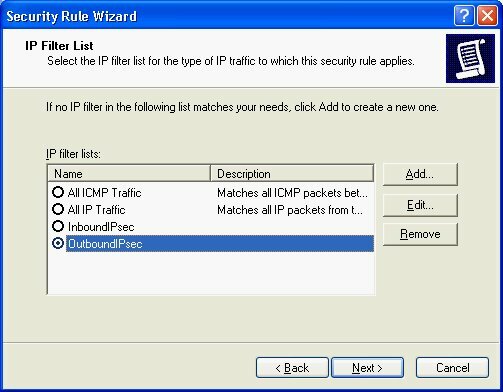 IPsec offers security and peace of mind over and above the traditional WEP and MAC-address filtering. NOTE: although this article was written with wireless communication in mind, it applies equally well to traditional wired communication as well. I have already written about configuring my FreeBSD IPsec gateway and workstations. 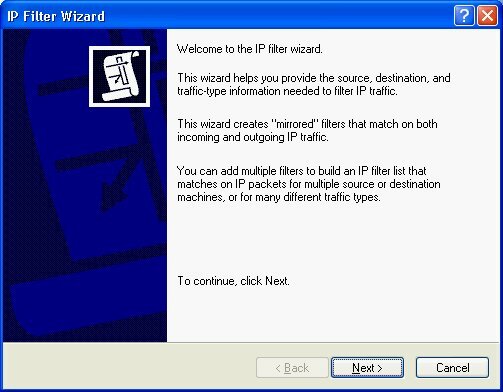 In this article I will show how I configured my Windows XP box to use the same gateway. The main resource I used for this exercise was FreeBSD Wi-Fi IPsec easy-setup guide (since removed from the Internet). You might ask why I'm writing about Windows XP on a website about FreeBSD? My terse answer is because I can. My realistic answer is because it will help people. It's something I did, with my FreeBSD gateway. I use XP on a regular basis. Use the right tool for the job. Sometimes that's XP. Sometimes it's FreeBSD. I will give a brief overview of the gateway configuration. I have a FreeBSD machine that functions as a dedicated wireless gateway. 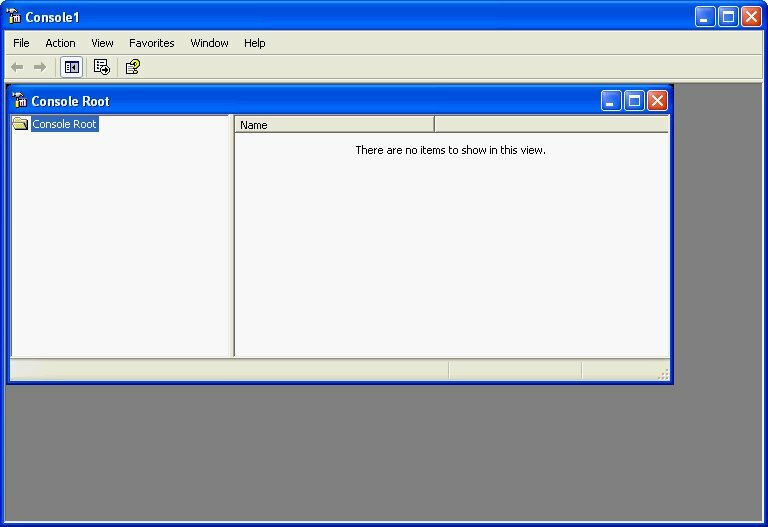 The primary purpose of this box is to keep out all the stuff that is not allowed and to ensure that only my machines are used on this WAP. I am using racoon as my key server. It does the job, but I'm hoping for other alternatives. 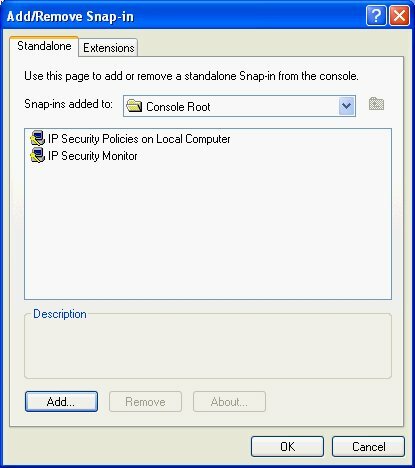 Sometimes I have to restart racoon on the gateway in order to get a session established. Here is the relevant portion of /usr/local/etc/racoon/racoon.conf. This works for my laptop whether it's running XP, FreeBSD 4.10, or FreeBSD 5.3. Click on OK, and you'll be back at mmc but with two new entries under Console Root. 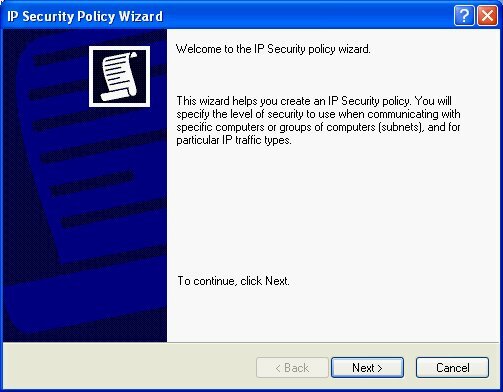 We are now going to create the IP Security Policy we will use on this laptop. 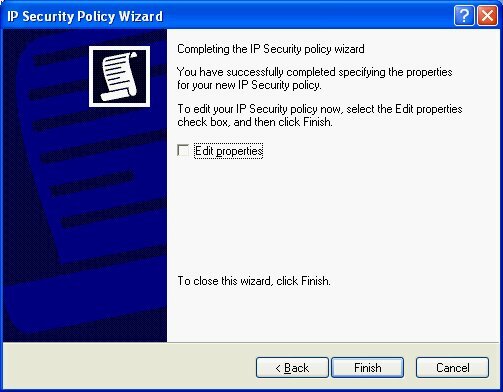 Start this process by right clicking on IP Security Policies on Local Computer and then selecting Create IP Security Policy. This will invoke the IP Security Policy Wizard. Be sure to uncheck Activate the default response rule. Also uncheck Edit Properties. Then click Finish. You now have a security policy, although it has no content.. Now we will define filter lists for the inbound and outbound traffic. When you get to the Filter properties window, be sure to uncheck Mirrored. This is important. 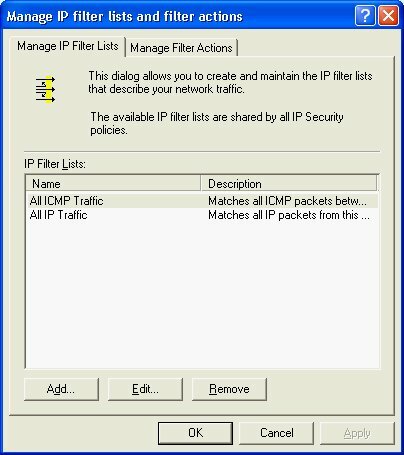 Now you should be back at the IP Filter List window. Your filter should be listed in the Filters section. Click OK.
You have now created your outbound filter list. Now we will create a similar list for the inbound traffic. As Timothy Ham cautioned, pay attention to what have now. 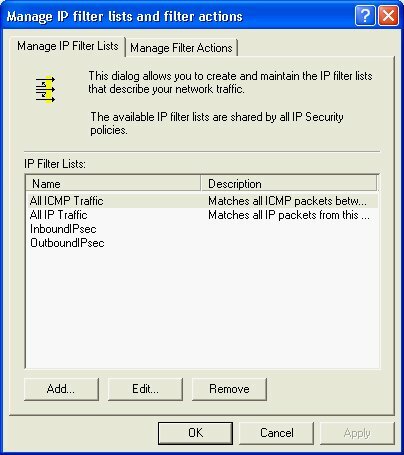 You should have two entries in IP Filter Lists. Each list should contain one rule. 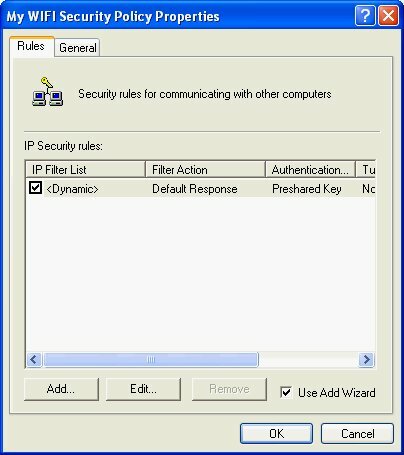 You should not have one Filter List, with two rules. Verify that the two filters are not mirrored. Click on Close and you should be back at the MMC console. Click Next, and you will see the Tunnel Endpoint window. 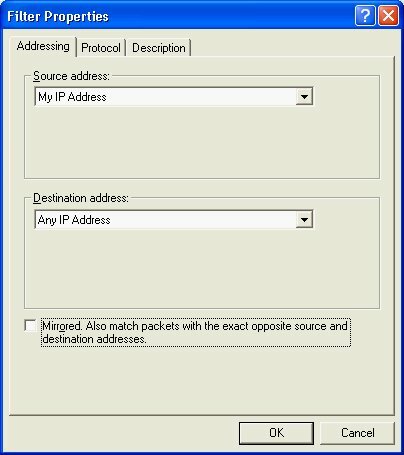 Click on The tunnel endpoint is specified by this IP address and supply the IP address of your gateway (for me, that's 10.0.0.1). 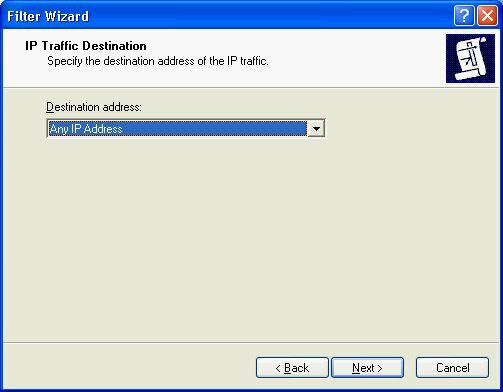 Click on Next, and specify the type of traffic that must be encrypted. I chose Local Area Network (LAN). I'm sure All network connections would work as well. Click on Next and select the Authentication Method. We will be using preshared keys. Enter your key on in the space provided. For testing purposes, I used the word secret. Click Next, and you'll be asked to select the Filter List against which this security rule should apply. 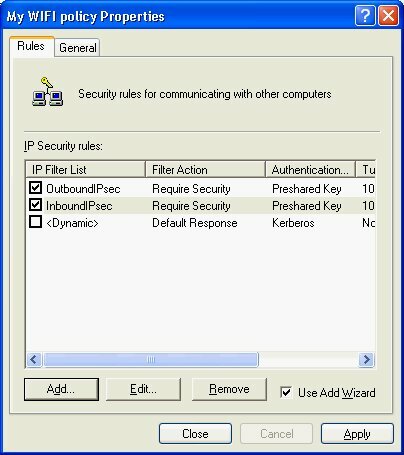 Choose OutboundIPSec. Click on Next. 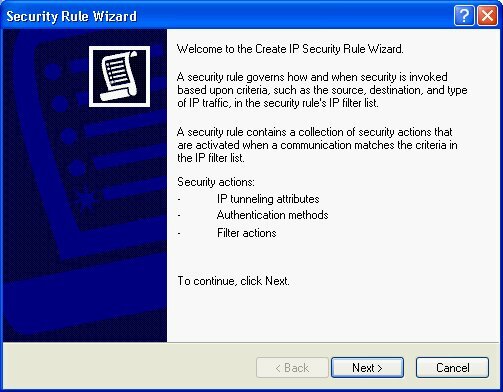 Select the action for this security rule. In this case, we want Require Security. We do not want any traffic to pass unless it is IPsec (note: DHCP etc will still get through without IPsec). Click on Next, and you will see the last window in the Security Rule Wizard. 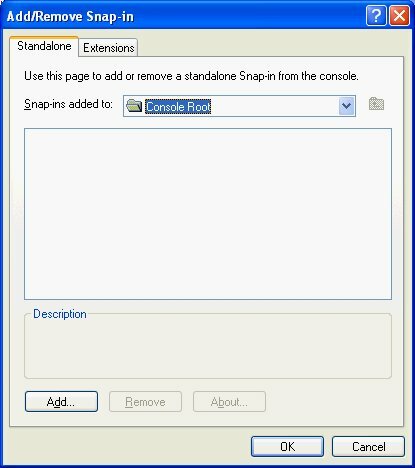 Ensure that Edit Properties is off, and click Finish. The tunnel endpoint should be the IP address of this PC. 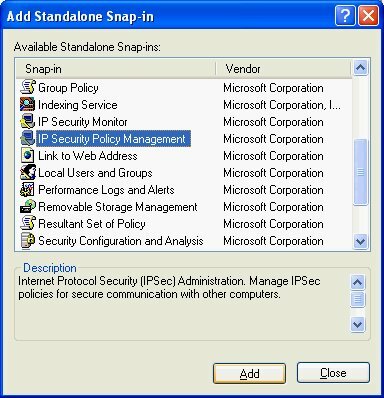 You will note that the Policy Assigned column contains No. That means your policy is not in effect. We will change that soon. Save your data using File | Save. I named my file wifi-console. 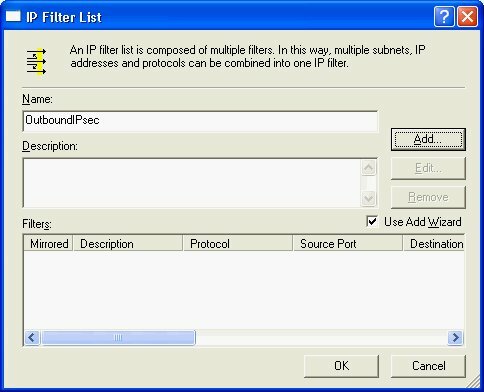 So far, we have established a policy, created two filter lists, and added one rule to each filter list. 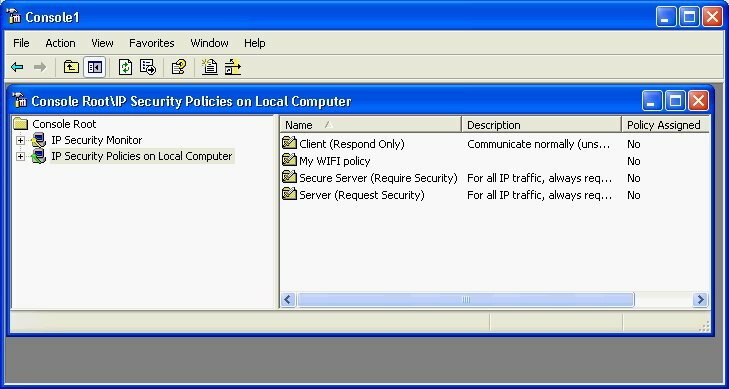 Now we will invoke that policy to ensure that only IPsec traffic flows between the laptop and the wireless gateway. 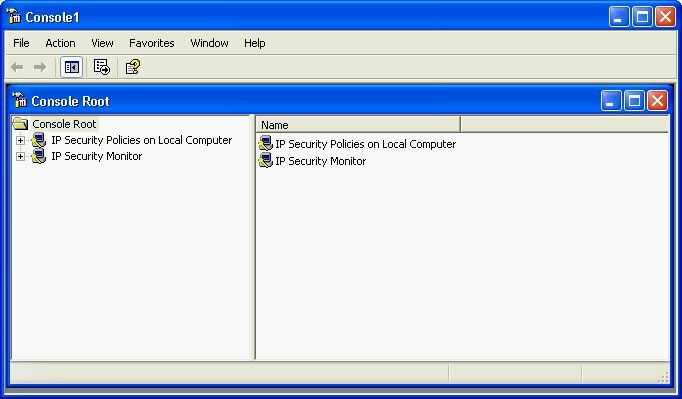 In this case, 192.168.0.20 is the internal IP address of my wireless gateway. That gateway also has the 10.0.0.1 IP address used above as the end point of the tunnel. 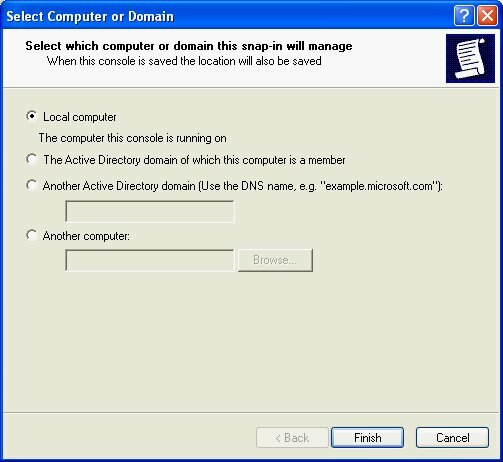 example.org is the domain name (not really, I changed it for this article) given to the laptop. 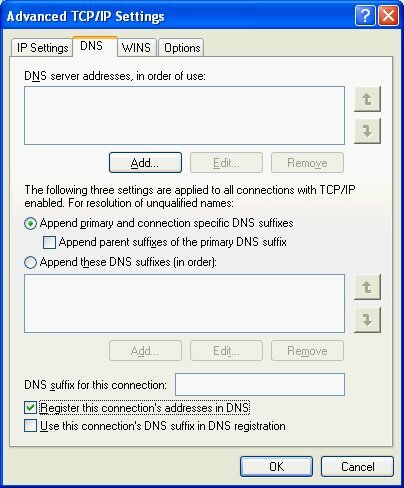 Under "This Connection uses the following items" select "Internet Protocol (TCP/IP)"
Uncheck Register this connection's addresses in DNS and you should stop seeing those messages.